This December I’ve decided to introduce a weekly book roundup to the blog, showcasing books in various categories I deem relevant. As we’re already immersed in the eight days of Hanukkah (this year it came early, running from December 2-10), I’m skipping ahead a couple of weeks to the needs of the home entertainer for Christmas and then NewYear’s Eve parties. Truth is, though, that many of these books could be (and should be) cracked open throughout the year. Getting together with friends and family–and feeding them–is such a massive demonstration of love, you’re really to be admired for taking it on, you home cook, you. These books are for you! Welcome to the Holiday Entertaining round up. Cook’s Illustrated knows a thing or two about putting together a fool proof meal, and since they test all of their recipes, this is a go-to book if you’re having guests for Christmas Eve or Christmas Day, for instance, and have no idea where to begin this holiday season. In this book, they’ve taken their over 20 years of testing experience and put together 75 delicious recipes that are sure to give you confidence in the kitchen during this stressful time of year. Whether you’re putting together a small celebration or a feast for your entire extended family and friends, there’s a chapter devoted to each delectable course, ensuring you create the perfect meal. And with recipes that include Roasted Cauliflower Gratin, Boneless Rib Roast with Yorkshire Pudding, Chocolate Truffles, and Spiced Pumpkin Cheesecake, I’ll be waiting for my invite! They say don’t judge a book by it’s cover, but I dare you to look at this book and not want to open it immediately! Author and food blogger Shelly Westerhausen gives you all the tools, tips, and tricks to create an incredible spread to impress both meat lovers and vegetarians alike. If you like finger food, you’ll be in heaven. I particularly like this book because while it’s a great resource for planning your next Christmas party, it’s not exclusively focused on the holiday season. There’s a great chart that offers suggestions for every occasion. You’ll be using these ideas all year long. Sweet and savory platters are featured. My next selection is for all the grain-free, dairy-free, and gluten-free food lovers out there. In 2018, there are more people with food allergies and dietary restrictions than every before, whether for health reasons or personal choice. But just because your diet’s changed doesn’t mean you need to restrict your ability to enjoy delicious comfort food. Danielle Walker transforms classic recipes and menus for twelve occasions throughout the year,including birthday cakes, finger foods, and even classics like peach cobbler and corn bread, using alternative ingredients that you’ll feel confident serving at your next event no matter who is in attendance. And everyone can eat up. Raise your hand if you’ve ever gotten an invite to a cookie exchange, gotten really excited, responded that you’ll be there, and then realized you now have to make the cookies. Next time, all you’ll need is this book. It covers everything cookie, from baking to decorating, and offers 50 recipes that are sure to make your sweet tooth tingle. Food isn’t the only thing you have to worry about when entertaining during the holidays. Hosts spend hours planning, cooking, and decorating. This book by the posh kitchenware and home goods retailer Williams-Sonoma serves as a guide and gives you everything you need, from complete menus and decorating ideas, to ideas for welcoming your guests into your home with style and ease. 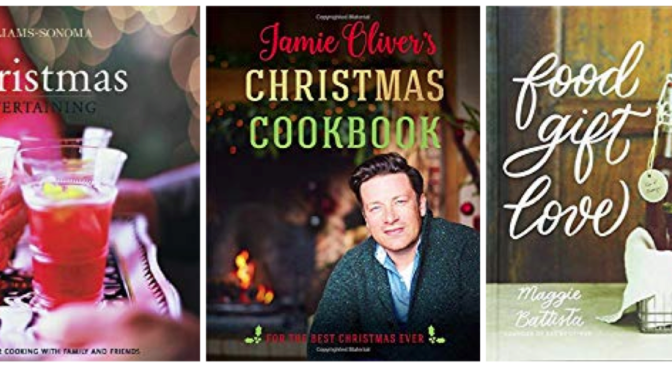 I’ve been a fan of Jamie Oliver for years. It never hurts to have a charming guy show you a better way to eat, America, right? His school lunch movement was impressive. Beyond that, he really knows how to cook! And this book contains all the classic dishes you need for the big day and beyond,as well as loads of delicious recipes for edible gifts, party food, and new ways to love those leftovers. And thanks, Jamie, for designing recipes whenever possible to cook in the oven at the same temperature for kitchen efficiency. That’s really helpful and lets us hang out in the living room with the people we love while the meal is doing what it needs to do in the oven. Roasting, baking, stirring, basting, frosting. Yum. Yum. Yum. Features include a party calculator for figuring expenses, advice for a party closet so you’re always ready if friends drop by. Granted, my NY apartment may be small, and most of my closet space is full of 20 years’worth of old crap I’ve been meaning to sort through and clean out with the help of books like The Life-Changing Magic of Tidying Up, but I love the idea of having friends spontaneously visit. For over three decades, Christmas with Southern Living has been the most dependable, comprehensive, and up-to-date guide to the holidays. Christmas with Southern Living 2018 brings an inspired new lineup of creative ways to decorate,entertain, and make gifts for the holidays. Festive menus and décor ideas,along with more than 100 brand-new recipes crafted by the professionals of The South’s Most Trusted Kitchen ensure success and wow factor at every turn. Also included are dozens of kitchen tips and entertaining ideas to take the pressure off the host. A special gifts-from-the-kitchen section includes simple but fun recipes for shareable foods, along with packing and storage information. Over 200 vibrant photographs inspire, showcasing unique holiday decorations–including table settings, wreaths, trees, centerpieces, and mantels–making Christmas with Southern Living 2018 the only guide you need to make the holidays memorable and spectacular. My choice for the crafty foodie and DIYer is Food Gift Love by blogger Maggie Battista. Small-batch,hand-crafted foods make truly great, highly appreciated gifts. The book offers 100 memorable, edible gift ideas with simple, delicious recipes, detailed wrapping instructions, and stunning photography. Recipes to show your love include simple homemade infused salts and sugars; instant-gratification gifts,like fresh ricotta and flavored butters; jams, pickles, and vinaigrettes; and irresistible cookies, desserts, savories, and spirits that will impress fellow food fans. Inspiration for cooks, food-lovers, and DIY fans. So, that’s it for now, my friends. Eat hearty. Love open heartedly. I’ve got to go because I think I just put on ten pounds in my imagination.